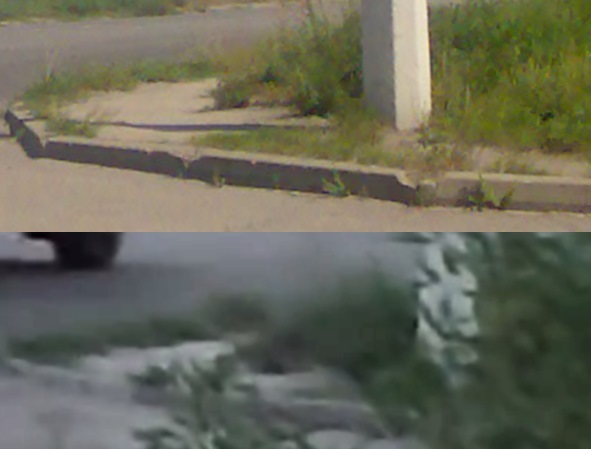 As I posted, images from a variety of sources strongly suggested this was a clear case of deception by the Russian Defence Ministry, showing the video was in fact filmed in rebel held Luhansk near the Russia border, and more photographs have now emerged that seem to confirm this is the case. 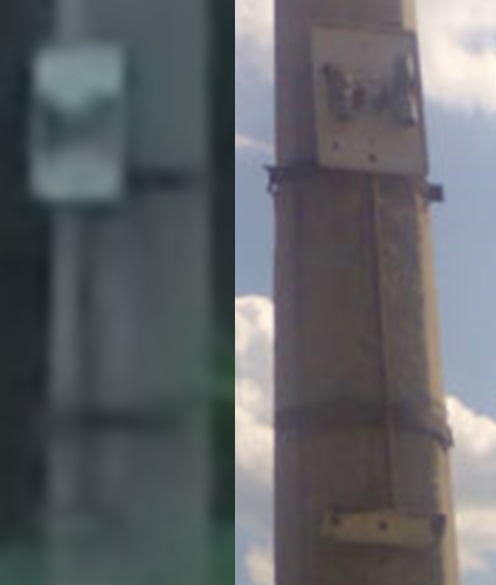 The above compares the two poles featured in the photographs and video, which appear to be indentical. The path and grassy verge at the base of the same pole is also indentical. Above the pole, the same arrangement of cabling can be seen. 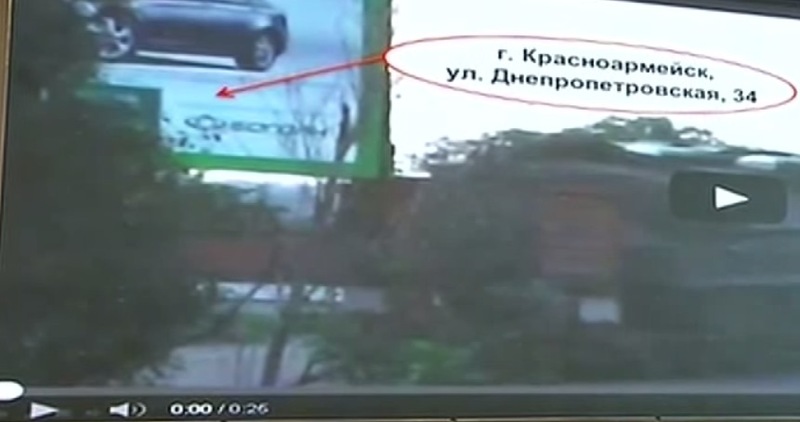 This, combined with the information in my earlier post, is strong evidence that the Russian Defence Ministry lied when it claimed the billboard was in the town of Krasnoarmeisk. Unless the Russian’s can come up with compelling evidence that the billboard was in Krasnoarmeisk, it’s clear the Russian Defence Ministry lied at it’s press conference on the downing of MH17. Good to see bellingcat up and going. I looked at the available material and it is indeed Luhansk. I wouldn’t be so bold or go so far as to say it was a deliberate lie but the Russian’s certainly got this point wrong in their presentation. The ad is used in many locations and the particular local dealership on the billboard can’t be read on video. Getting a point like this wrong certainly weakens credibility. I would certainly like to hear what the Ministry have to say. Have you sent the analysis to them and asked? While the location checks out and I was able to estimate the point from which the video was shot it certainly was a fortuitous piece of videography. The camera operator probably had less than 50 seconds from first hearing/seeing the truck to set-up the 6 second shot. From my analysis there may have also been an opportunity for the camera operator to have filmed it handheld before it reached the overpass. It does appear from the lack of wobble the camera was on a tripod (I didn’t mention these points in email). It is worth pointing out, if I am correct, that this is the only shot of the BUK on the transporter where the missiles are visible. The camouflage netting-tarpaulin has been pulled back or is missing. I did note that this was odd. However, subsequently I have also seen video of a BUK unit collecting overhead wires so apart from sloppiness by the people loading the unit the camouflage may have been pushed back by accident. Together with the video and photographs of apparently the same transporter and BUK around Torez and Snizhne and also intercepts of phone conversations with the driver released by Ukrainian security it does make a compelling circumstantial and consistent case. Of course one should always be wary of speculating beyond the “evidence” and while I suggest it was a fortuitous shot it does appear to be doable and that the shot was a bit “too nice” this too is speculative. What isn’t speculative is the location given in the Russian presentation is wrong. While we wait for the live imagery from the U.S’s keyhole satellite (allegedly overhead at the time) of the actual launch and impact the citizens open source case is being refined and in this case produced a result. All of Bogdan’s billboards have the green borders, like coca-cola has a red lable. The disinformation about “Krasnoarmeysk” was deliberate. It was not just the Russian Defense Ministry, but part of a deliberate campaign. On July 20 and July 21, over a weekend, we reported on massive injection of identical posts in numerous Russian social media forums, Facebook and Twitter, pushing the theory of “Krasnoarmeysk”. I watched in real time as this happened that weekend. First they appeared on Russian and Western social media; then on Russian state TV, then on Russian-backed separatist web sites, and then finally became part of the official Defense Ministry briefing on Monday, July 21. This wasn’t merely an error, this was a deliberate attempt to simulate “crowd-sourcing” of geolocation efforts. 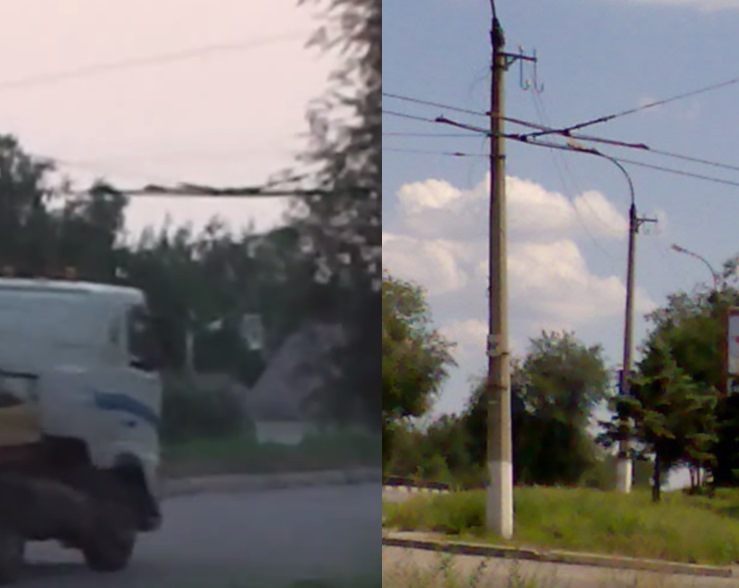 First the Kremlin trolls, then the Defense Ministry claimed to identify the street address of the Bogdan car dealer from the billboard, even though we know that street address was not visible in the short video clip of the Buk. 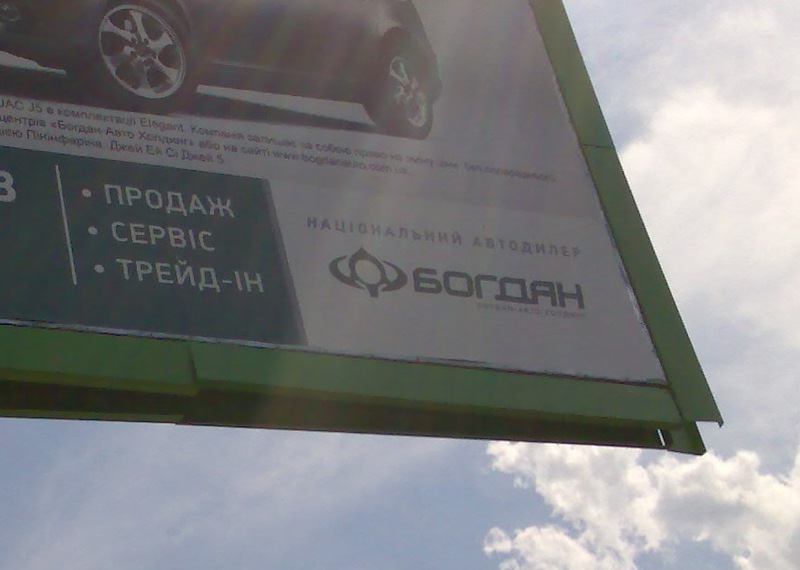 There are such car dealerships in a number of Ukrainian cities. The Defense Ministry then claimed that a cluster of buildings near the Bogdan show room in Krasnoarmeysk matched the photo, even geolocating it falsely on Google Maps, and citing as well a Stroidom store at 49 Gorkogo Street. @AricToler looked at this https://twitter.com/AricToler/status/491244595938725891 and we did, too, and didn’t find it convincing. We concluded that the elevation was all wrong, using three points: 1) the existing Google Street View photos for Krasnoarmeysk that showed that area to be flat — from the billboard/Buk video we knew that it was taken from the vantage of an elevation, and that the roof tops of other buildings were below it on another street (the red roof looked like a fence); 2) the Stroidom store on Gorkogo St. is two stories, and that wouldn’t match with the building in the Buk video; 3) the Krasnoarmeysk mall roof is flat and wouldn’t match the sloping roofs in the video. There was of course the other issue of the absence of trolley-bus lines. Ofcourse, nobody’s ever seen that “Buk” being launched, so the US State Dept trolls are angling in on a moot point, as usual. And judging by the launch noise, prevalent smoke trail during entire trajectory, QUITE MANY people should have noticed and remembered the launch event. I have no way of definitely telling Krasnoarmeysk from Luhansk, but the obvious pinkish hue of the sky suggests video was taken at dusk or dawn. Early morning 18th does work and would work even better if the truck was entering the ramp with camera pointing in eastbound direction. With your geolocation pointing towards generally southbound direction, this argument is significantly less elegant. Can, however, be conclusively proved or disproved by a control shot taken at the location on the same date any year when the skies are clear. In general, funny colored skies would be characteristic of strictly eastbound direction for sunrise and westbound for sunset, but it depends on exact location of course. Should repeat year after year though. This shot also possibly further absolves the poor 53rd. In the shots you post, the few missiles their supposed convoy has mounted on their TELs all have red nosecones. This one has white nosecones. Is there any meaning to that as in the likelihood of a mixed payload? Hard to say without the general meaning of cone color being addressed. Unfortunately, cannot see the missile cones under the net in Torez, but maybe somebody else can? This is the entire 1st Battalion of the 156th previously based in Avdiivka where they were involved in a firefight where they certifiably lost 2 of their TELs. I don’t know exactly when, but somebody else likely does. They also seem to have expended most if not all of their missiles. Were they shooting at something? Avdiivka is well in range to have taken that shot. This location Lozovaya is no longer in range, but on a road from Donezk to Kharkiv taken no later than 20th when it was posted. Generally, the same situation as “Separatist Buk” clocked in Luhansk supposedly on the way to Russian borde except that they have their batallion-level command and radar vehicles with them, enabling targeting elevations up to 55 degrees. A lone Buk-M1 could not have taken the shot trigonometrically should it really be restricted to 7 degree elevation over horizon. Avdiivka is out of range to have shot down MH17. 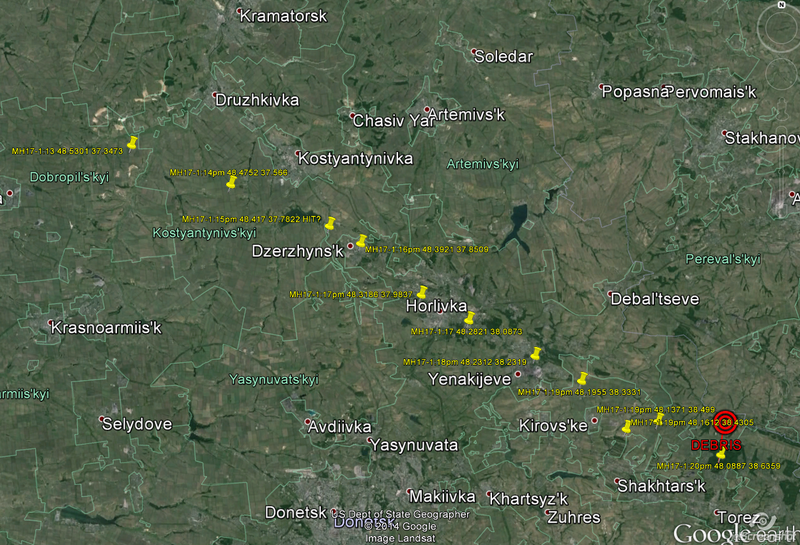 Avdiivka is in to the flight path MH17 has taken. It is impossible for this moment to simultaneously correspond to the moment the missile hit and the moment the plane hits the ground. There should be several minutes and tens of kilometers in-between. The plane may be descending gracefully or badly stalling, but it is likely to accelerate, not slow down like you think. Finding the bulk of the debris not in Hrabove 8.5 km away where MH17 memorial is, but mere hundreds of meters in direction N, near opposite where the plane was going is impossible without significant internal explosion throwing them there. The plane disintegrates when it reaches transsonic speeds or hits the ground, with the tail section with the flight recorders the least likely / last section to go. Always. In this case especially, with the missile hitting the front end of the plane. There is no need to invent anything about the 53rd. It adds nothing to intercepts implicating Russia, if they are real. The separatist did have a Buk, but nowhere it is seem with 332 or 3×2 visible. Why bother with this junk? My point is that there were obviously other Buks around, quite in range and likely shooting at something. Why is this stuff not only dismissed, but covered up? Have I got new for you. Take a look at some calculations in my Twitter for Avdeevka. Its actually 66+ km away, but that matters not because the missile is up to 6.2 times faster than the plane, giving differential of 5.36 of plane’s cruising V ground. This means the missile gets to cover only 12.4 km to catch up flying behind the plane. This works no worse than their case, which is 15.9 km of distance covered by frontal collision in which speeds ad up to ~7x the planes for approach speed. This produces 10 seconds from target to kill, with missile covering only 2.4 km ground distance from the launch location to impact. If you don’t realize how ridiculous that launcher placement is. And obviously fake. So, Avdiivka case works much better were the plane to be targeted at a location recorders supposedly has for 1:17 timestamp, some 29 km away. That would of course mean that from 3 minutes to 13:20 last ping, 1/2 to 2/3 time was spent by missile getting there and 1 – 1.5 m for plane falling. Utter hogwash, because that missile accelerates near instantly to supersonic speed. Incidentally, the plane also needs to accelerate to near supersonic before (and why) it falls apart into small enough bits that fall slower than the plane was originally going at 10 km. This takes longer than supersonic missile does no matter how you cut it. Everything is much better if you say 13:20 timestamp goes with 13:17 location, with the current one as fake as they come. Have tons of proofs, many interactive. With that much attention to unnecessary visual detail looked at here, was only able to finally clarify the location using this video. ul. Stapana Razina in Luhansk enters the ramp only in W-bound direction and does not exist on the other side of the ramp The only other street mentioned Nechuya-Levitskogo crosses the freeway at straight angle with no ramp, which likely means passing underneath it. That one goes SW. This observation together with pink hue of the skies in front of the skies means this was not taken at sunrise but at sunset. Because truck is driving West! That seems to not change much, so why lie here. With Bellingcats overobsession with video evidence, where are the red- or green- tipped missile that 53rd brought with them? These are white tips. Of course, there must be in those trucks? Or not from the Kursk convoy maybe? Of course, this is silly, but there ought to be a meaningful argument about what those color codes mean in relation to missile type. The nosecone JIT is showing off now is colored zinc bucket, which I don’t see on any actual Buk missiles. They were some Buk duds with very distinctly preserved red nosecones found in Syria (some people mistook them for downed Tomahawks and others made fun of them) Why is the nosecone they show so well preserved, but not white?